Dr.Jane Plant led us to Mrs Patricia Peat at Cancer Options. I was very sceptical and too ill to travel, but my daughter visited Patricia and was very impressed with her experience and understanding. We followed all her advice on how to support the immune system and ways to strengthen the body to tolerate the orthodox treatment. On the renewal date I was feeling very much stronger and plucked up sufficient courage to visit Patricia with my wife and daughter. Meeting Patricia was a relaxing experience and so very reassuring. There was time to discuss my worries and listen to her sound advice. 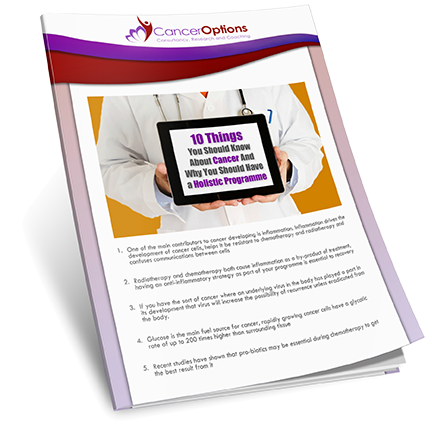 There is a growing demand in this world for health creation and Cancer Options can be trusted in this regard. My family and I are so pleased to have found you Patricia. You have helped me to have a better quality of life. Thank you for being a very important part of the team, for helping us to put most things into perspective and for your patient support and ability to deactivate my ‘white coat syndrome’. I knew the importance of an integrated approach to cancer. I didn’t know Patricia then but sorely wished I had. However, she has recently helped me enormously in supporting my father who was sadly diagnosed with pancreatic cancer at the age of 82. Her work over the year allowed him to go through chemotherapy without many of its debilitating side effects and somehow enabled him to avoid the terrible pain associated with cancer of the pancreas. That, in my mind, was nothing short of a miracle. I know without a shadow of a doubt that my father’s journey would have been very different without Patricia’s integrated approach and cannot speak highly enough of the work that she does, her wealth of knowledge and for simply being the kind, down to earth and dedicated person that she is. The biopsy showed that in fact the cancer had NOT returned and what the doctors had seen on the MRI was post radiation changes and chronic inflammation . I guess , with what has happened over the last two years , together with the tone the surgeon adopted 3 weeks ago , I had feared the worst . Your help has been invaluable and I shall continue with some of the changes to lifestyle and diet that I have healing order to continue healing that part of my body (which is still pretty sore from the biopsy ) . I have no hesitation in referring anyone who is dealing with cancer and it’s after effects, to you in the future. A friend who had had a serious cancer recommended Cancer Options to me when my husband was diagnosed with both bowel cancer and mesothelioma ( separate cancers ). I had already been made aware through the same friend of Vitamin C as a complementary therapy and whilst we pursued the more orthodox treatments of chemotherapy and radiotherapy we became more interested as we went along in an integrative approach. As the weeks went by and I tried to find out more information which could help my husband in this battle I realised what a minefield it was out there ! Once Cancer Options had been recommended to us I contacted them and set up a telephone consultation with Patricia Peat.We had an hour long discussion which was invaluable – Patricia is down to earth and highly knowledgeable, we felt we could ask her any question and she showed support for what we had done thus far whilst being able to suggest even more treatments which could help , both orthodox and complementary. About a week later we received a detailed report tailor made to my husband`s particular needs – this covered nutritional advice and suggested supplements as well as recommending oxygen therapy ( which we have continued ever since ). Patricia also told us of a surgical team who were excellent in the field of bowel surgery should that ever be an option for my husband. We arranged a follow up consultation once the various treatments had been pursued and CT and MRI scans had been done. I am pleased and amazed to report that the CT scans after a couple of months showed my husband had had a remarkable improvement in his lung disease and some weeks later his bowel tumour had reduced to such an extent that surgery was indeed now an option ( from being classed as palliative ). We had appointments with both lung and bowel surgeons and he was offered operations for both diseases. We are a week on from a very successful bowel surgery performed by the very team Patricia recommended and in the coming weeks will go to see the surgeon about an operation for mesothelioma which hopefully will give longer life expectancy and improved response to further treatments. Finding Cancer Options has been a huge turning point for us – it has made sense of the most confusing and agonising situation and has helped us both practically and psychologically more than I can describe. That's a bold statement but speaking as one who nearly didn't make it here is some good news. It's only two words, well four actually. Patricia is kind, compassionate, extraordinarily knowledgable with masses of experience in both the mainstream and the integrative side of cancer care. She and her sidekick Hayley can help you navigate the, at times bewildering amount of information that a newly diagnosed or long term patient has to digest. She truly believes that the battle for cancer needs a multi faceted approach, from diet and supplements all the way through to mainstream medical interventions. Her open minded attitude is truly refreshing after the somewhat blinkered view one often encounters and as an oncological nurse, with numerous years experience, she is perfectly placed to advise on all aspects of cancer care. I arrived at her door a very sick man, sliding inexorably downwards and she kindly showed me how to start turning things around. Her positivity and infectious humour are a tonic in themselves, and that's before she starts dispensing her wisdom. And if that wasn't enough she works closely with doctors in Germany that seem to terrify most British oncologists. Why, because in Germany there are doctors who's success rates and treatments most hidebound British consultants can only dream of. Over there the mainstream works WITH the integrative offering a full broad spectrum approach. And whilst in the U.K these treatments are regarded as "cutting edge", in Germany they are just regular treatments. I am fortunate in two respects, firstly I seem to be making good progress, secondly and inextricably linked to that, I met Patricia; who orchestrated, informed and helped me dare to believe. Thank you from me and all my family!! Just had a third MRI report showing tumour stability – almost a year now! I want to thank you once again for all you have done to help me achieve this. My health is going from strength to strength and I have few problems with the tumour (symptom wise) as it is. Can eat, speak, laugh and live a good (maybe even a long) life. Just to say that my wife and I are enormously grateful to Patricia for her time this morning and for all her insights and suggestions. These come at what may be a critical time for me, as we consider options with clinical trials and second-line treatments. I do feel that Patricia understood so many of my specific concerns, and it sounds as if she'll be able to give me some closely targetted advice on how to proceed. I only wish I had come across her months ago! It was only yesterday when we talked the last time. This yesterday was about two years ago. I did not forget you. I will never forget the strength and the courage you gave me. The possibility to 'do it my way' was thanks to you. After our last talk I finished my chemotherapy, and kept on with all the alternative treatments. I dance, I teach, I am healthy. I just wanted to let you know I am 3 weeks post op and recovering well. A few days the pathology results came back clear. I think the natural treatments and the biopsies did the job. I must say I will never know if the surgery has been completely necessary, but I do not have the part of my body where the cancer started so that is a good thing, I think. In the process of this journey, I have learnt a lot about myself, have learnt to take better care of myself physically and value my life now - something I didn't before. I hope to take all the lessons forward with me, emotionally and spiritually. I had a chat with God before the surgery and I have been given another chance to treasure the life He gave me. I don't have any religion, but I do believe in a loving God, who gave us the potential to be so much more - so my own healing and growing journey will continue beyond the cancer. I still have many steps to take, but I have come out of the apathy that had gripped me for the last number of years. Thank you so much for your knowledge and guidance. It helped tremendously - your honesty was very much appreciated. Thank you so much for your support and I wish you well. I must tell you that the information and advise from Patricia has been marvellous and helpful and more so given me hope and a great feeling of victory over this. Thank you so much. All cancer patients need a couple of Patricia's in their lives!